FILE - Smoke rises from a brick kiln in January 2015 in India. The World Meteorological Organization reported earlier this year that greenhouse gas concentrations in the atmosphere in 2014 hit a new high. Through the U.N.'s Clean Development Mechanism (CDM), the plant can sell those emissions reductions to polluters elsewhere. And through the U.N.'s recently launched Climate Neutral Now website, those polluters can include attendees who flew to the climate change conference. So meeting-goers are encouraged to log on to climateneutralnow.org. Svenningsen compares it to the Amazon.com of carbon offsets. It has a calculator so shoppers can compute their share of the carbon dioxide produced by their plane ride. The next step: Go shopping for offsets. 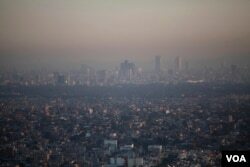 FILE – Mexico City has been deemed among the most polluted cities in the world. The system is based on the somewhat controversial concept that someone who puts greenhouse gases into the atmosphere can pay someone somewhere else to take them out, or to not produce them. The most familiar types of offset programs involve planting trees to soak up carbon dioxide. Under the Climate Neutral Now program, offsetters can fund projects intended to prevent other emissions from happening, such as bus rapid transit in Zhengzhou, China; methane capture at a starch plant in Thailand; and wind power in India. The Nueva Aldea biomass power plant, for example, would not have been built without CDM funds, according to Svenningsen. "This could be a coal-fired plant instead. The difference of your purchase is that they'll actually have a clean energy plant instead of a fossil energy plant." "And over time, [they] realized that you actually have to do more,” she said. “And you have to do more of this, and you have to really make sure you're not doing that. And then you've got to have somebody actually check." She says CDM certification is now among the best available.